For other uses, see Bribie Island (disambiguation). View of the Glass House Mountains from Bribie Island. Bribie Island is the smallest and most northerly of three major sand islands forming the coastline sheltering the northern part of Moreton Bay, Queensland, Australia. The others are Moreton Island and North Stradbroke Island. 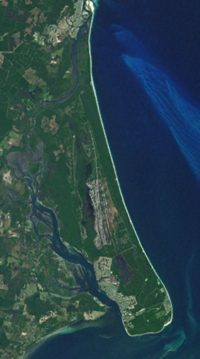 Bribie Island is 34 kilometres (21 miles) long, and 8 kilometres (5.0 miles) at its widest. Archibald Meston believed that the name of the island came from a corruption of a mainland word for it, Boorabee. meaning 'koala bear'. Most of the island is uninhabited national park (55.8 square kilometres or 21.5 square miles) and forestry plantations. The southern end of the island has been intensively urbanised as part of the Moreton Bay Region, the main suburbs being Bongaree, Woorim, Bellara and Banksia Beach. A bridge from Sandstone Point on the mainland was completed in 1963. Buckley's Hole, at the southern tip of the island, is an important bird habitat and refuge. Crossing to southern part of the island from the mainland via the bridge, the first suburb to be encountered is Bellara. The other four suburbs in the southern half of the island are Woorim (about 5 kilometres (3.1 mi) away on the island's 'surf side'), Bongaree at the southern end of the island, on the 'calm side' or 'passage side' and Banksia Beach and White Patch at the northern end of the populated area, also on the 'passage side'. Two other localities, Welsby and Bribie Island North, make up the undeveloped northern part of the island. Bribie Island North is part of the Sunshine Coast Region while all of the other suburbs on the island are part of the Moreton Bay Region. Bribie Island Coaches operates a bus service around the Island as well as a route which runs to Caboolture and Morayfield via Ningi and Pebble Beach. In August 2007 an alternative route, via Beachmere and Pebble Beach, was introduced. The service to Caboolture is timed to connect with trains to and from Brisbane. There are many types of wildlife present on the island. Kangaroos, wallabies, emus, various snake species, green tree frogs and dingos can often be seen venturing from the national park into the surrounding suburbs. Pumicestone Passage, located between the island and the mainland, is a protected marine park that provides habitat for dugongs, turtles and dolphins. There are also extensive mangrove forests in this area. Eucalypt forests, banksias and heathlands are the predominant vegetation elsewhere. Bribie Island is home to around 350 species of bird. This includes a range of honeyeater species, lorikeets, waterbirds and birds of prey. Flying foxes (also called fruit bats) visit the area, along with several species of small insect-eating bats. Flying foxes are important pollinators and seed dispersers while the insect-eating bats help control mosquito and other insect populations. Buckley's Hole, at the southern tip of the island, was declared an environmental park in 1992. Bribie Island National Park covers 55.8 square kilometres (21.5 square miles), nearly a third of the total area of the island. There is a common misconception that the national park covers most of the non-inhabited area, but in fact most of the centre of the island consists of conifer plantations closed to public access. Formerly leased to CSR Timber, the Queensland Government is currently re-planting around 25 square kilometres (9.7 square miles) of this area through its DPI Forestry arm. Much of the rest has been developed for housing. In 2009 the Queenslands National Parks and Wildlife Service (QNPWS) used imported blocks of rock to prevent access to roads and tracks leading into the national park forcing all vehicle access to the park to be via the Beach Access Track at Woorim or the Ranger Station at Whitepatch. All access to the national park now requires a permit to be purchased. Local residents were threatened by letter with fines of up to $16,000 by QNPWS in 2009 for walking domestic animals within the park. The inhabitants of Bribie Island at the time they were encountered by Matthew Flinders in H.M. colonial sloop Norfolk in 1799 were the Djindubari people. broadly part of the 'Kabi' or more correctly Gubbi Gubbi people of South-East Queensland. Meston recorded the pre-contact population of Aboriginal people as 600–1,000, but by 1891 none remained on the Island and only four lived on the mainland. The comparatively rich coastal country allowed permanent residence. Natural resources of land and sea were abundant and harvested according to the seasons. Winter mullet schooled from May to July. Dolphins were trained to herd the fish into waiting nets and spears. Winter was the best season for bream, followed by tailor in September and October. In summer mud crabs and oysters were plentiful and dugong were hunted. Summer whiting and flathead were speared or netted. Bungwall Fern was gathered for its starchy roots all year round. Kangaroo, eels and carpet snakes were rich in protein and fat. The dominant shellfish used as food was the oyster known today as the Sydney Rock Oyster known locally as tibir, at that time growing naturally on the seabeds. The oyster middens, many metres thick, were plundered by early settlers for lime. A significant midden site, now lost, was located not far from Bongaree jetty. It contained discarded shells, marsupial bones and stone tools. The biggest of the oyster middens was at White Patch, where dugong were also plentiful. The Ugari (pipi) on the coastal beaches was also eaten. Lieutenant James Cook sighted the Glass House Mountains west of the Island on Thursday 17 May 1770 while sailing up the east coast of Australia in HM Bark Endeavour. He called these hills the Glass Houses as the reflections and the shape of the hills reminded him of the glass manufacturing houses back in England. James Cook named the area Glass House Bay and was the first European to name this stretch of water. On 16 July 1799 Captain Matthew Flinders left Glass House Bay about two miles (3.2 kilometres) east of the shore in the Norfolk. He sailed south-west between Moreton Island and the mainland parallel to the southern shore of Bribie Island until spotting an opening in the low western shore. He anchored at 8:15am and transferred with a small crew and Bongaree to a smaller craft. He landed on Bribie Island unaware that it wasn't the mainland and met a small group of Aborigines who had gathered on the beach. Although Bongaree didn't speak the same dialect as the local aborigines the meeting was peaceful until one attempted to remove Flinders' hat. Flinders refused and the Europeans and Bongaree returned to their boat. As they left the man who had tried to remove Flinders' hat threw a spear that missed the small boat and crew. Flinders fired his musket at the men on shore and wounded the man who had thrown the spear. The Aborigines fled the beach. Flinders named the southern shore and site of the confrontation Point Skirmish. There is an area on the modern map marked Skirmish Point but should not be confused with the actual place of the incident which is known as South Point. Flinders needed to repair leaks in his boat and pulled it ashore some five miles (8.0 kilometres) north of the area he had the incident with the locals for those repairs. Once his boat was repaired he explored the mainland side of the passage and scaled Mt. Beerburrum to get a view of the area. He spent 15 days in the region. It was not until some time later it was determined that this was an island and the changing of the name of the waterway between Bribie Island and the mainland was made at some other point. In those days there was a prisoner among the others who made baskets for the Government called "Bribie, the basket maker." He was not chained, and was allowed to go about in a boat to get cane from the scrubs for his work. ... It was from this man Bribie, my father thinks, that Bribie Island got its name. He cannot remember distinctly on this point, but has some vague recollection of a connection between the man and the island – whether he was blown ashore there, or what, he does not know. Bribie Island fortifications were constructed from 1939 to 1943 as part of the defence of South East Queensland during the Second World War, and to provide artillery training for Australian soldiers. Other fortifications throughout Moreton Bay during the war, included at Caloundra, on Moreton Island at Cowan Cowan Point and Rous. Together with the existing installations at Fort Lytton, they provided a coordinated series of defensive batteries for Moreton Bay. In February 1939, six months before the start of WW2, a review of the defences of Moreton Bay called for two 6 inch Mark XI guns at north Bribie. Soon after Australia declared war on Germany on 3 September 1939, 6 inch guns previously carried by the World War I-era cruiser HMAS Sydney were taken to the present location of Fort Bribie (26°51′35″S 153°07′47″E﻿ / ﻿26.859763°S 153.129656°E﻿ / -26.859763; 153.129656﻿ (6" guns from HMAS Sydney at Fort Bribie)) to guard the northwest channel, which ran close to the shore near Caloundra, across the bay in a southeasterly direction towards Moreton Island, and then southwesterly towards the mouth of the river, forming a Z-shaped route. The most effective sites for guns were the closest points to the channel bends. The mounting and placement of the guns was hopelessly inadequate and according to Major General Robert E Jackson, Officer in Charge of Northern Command in July 1940, Fort Bribie was "no value from a defence point of view" and had to be fixed. Before this could happen an argument about the location broke out, costings being sought for both Bribie and Caloundra. It was argued Caloundra was higher, better equipped and cheaper to build, whereas Bribie was flat, hot, infested with mosquitos and sandflies, had no freshwater, no bridge and would be much more expensive. The decision came down to Fort Bribie's ability to cover both entrances to the northwest channel, while Caloundra could only cover the most northerly entrance. The guns had a range of about 19 kilometres (12 mi). Colonel JS Whitelaw designed the layout of the fort on Bribie and recommended its completion, receiving the go ahead by early 1942. By April—hastened by the December 1941 attacks by the Japanese forces on Pearl Harbour, Malaya, Hong Kong and Singapore—construction of the gun emplacements was almost complete. The construction cost of all of Fort Bribie's concrete structures was ₤55,000, about $2.5 million in 2010 dollars. On 19 February 1942, Darwin was bombed in two raids killing at least 243 people and wounding between 300 and 400 more. By November 1943 Darwin was bombed 64 times, with other towns also attacked including Townsville. The ferocity and success of the attacks suddenly created a very real dread in the Queensland population. In July 1942 after failing to take Port Moresby by sea in the Battle of the Coral Sea, the Japanese landed on Papua New Guinea's north coast and moved south, capturing Kokoda on 29 July. This was the first time any Australian territory had been occupied by an enemy force. Reinforcements were sent to Fort Bribie and Fort Cowan Cowan, strengthening the existing defences at the two forts. A number of 155 mm (6.1 in) guns from the First World War were provided to upgrade Australian coastal defences, and new forts were constructed during 1942-43 at Skirmish Point on south Bribie Island and Rous on Moreton Island. The Skirmish Point Battery at Woorim contained two fixed 155-millimetre (6.1 in) gun emplacements on Panama mounts. The Pacific War also brought the Americans soldiers. It was widely believed at the time that the American and Australian armed forces and governments had conspired on a plan to abandon Australia north of Brisbane to the Japanese in case of invasion. The plan, known as the Brisbane Line was never official policy, but the alleged strategy gained support after General Douglas MacArthur referred to it during a press conference in March 1943, where he also coined the term 'Brisbane Line'. Many historians of the WW2 period on Bribie island refer to Brisbane Line and draw it from Fort Bribie due west to Charleville, then south-west to a point just west of Adelaide, as recounted by Warwick Outram in Bribie Memories 2nd edition 2009 ISBN 978-0-9751971-4-1. George H. Johnston, War Correspondent for the Argus newspaper was present when MacArthur mentioned the Brisbane Line on 16 March 1943, but later clarified the matter by writing it was Gen. MacArthur who abandoned the Brisbane Line concept and decided that the battle for Australia should be fought in New Guinea. At Fort Bribie itself, two mine control huts were used by Royal Australian Navy during 1942 and 1943, known as RAN 2. These monitored and controlled the guard indicator loops and mine loops set in the North West Channel. The indicator loops relied on a moving magnet or any large mass of metal, which naturally acquires magnetic field, to induce a current in a stationary loop of wire. If a submarine was detected by the guard loop, the operator would wait until there was also a swing mine loop before detonating the mines by sending a current down the mine loop. RAN 2 was moved to Cowan Cowan on Moreton Island in September 1943. When the mines in Moreton Bay were decommission at the end of the war, six were missing. One was found at Tewantin in 1945. The mines weighed 1,430 kilograms (3,150 pounds) and were buoyant, so needed to be moored with sinkers, up to 25 metres (82 feet) below the surface. Every 5 minutes hour perturbations due to the tides known as perts had to be recorded. Daily and weekly tests were carried out on all equipment. In three years of operation, the mines were never detonated. Another minefield with guard loop built in 1942 protected Pearl Channel and Main Channel south of Bribie Island. The guard loops ran from the Loop Control Hut at the end of North Street, just north of Woorim to Combouyuro Point, Moreton Island. Three Harbour Defence Asdics, sea-bed mounted submarine detection devices now known as sonar, were position down-channel from the guard loops, as a second means of detection. The Bribie Island library opened in 1976 with a major refurbishment in 2016. Federally, Bribie Island is contained within the Division of Longman which since 2016 has been represented by Susan Lamb MP, a member of the Australian Labor Party. Rick Williams is the Australian Labor Member of the Queensland Legislative Assembly for Pumicestone which includes Bribie Island within its electoral boundaries (2012) while the current Moreton Bay Regional Council Division 1 councillor is Brooke Savige (2016). The artist Ian Fairweather lived on Bribie Island for many years in self-inflicted poverty. A park on the island is named in his honour at the corner of First Ave and Hunter St Bongaree. Brisbane Broncos players Jack Reed, an English representative, and Matt Gillett, a State of Origin representative grew up on Bribie Island. Bribie Island's main shopping centre is at Bellara, comprising a Woolworths supermarket and a Target store, as well as a number of nationally known companies such as Telstra, Rockmans, Priceline Pharmacy, Nextra Newsagency, Liquorland, Brumby's Bakery, EB Games, Flight Centre, Millers, Prouds, Donut King, Mister Minit, Spendless Shoes, Strandbags and Gloria Jean's Coffees. The island also has an additional Woolworths supermarket at Banksia Beach, as well as an Aldi store and two large IGA supermarkets located at Bongaree and Woorim. Traditional "strip" development of shopping facilities around the island provides a comprehensive array of retail businesses such as hardware stores, medical centres, newsagents, chemists and food outlets. There are two large, modern hotels—the Bribie Island Hotel at Bellara and the Blue Pacific Hotel on the 'surf side' of the island at Woorim. Residents and visitors often prefer to visit local clubs such as the large and award-winning Bribie Island Citizens and RSL Club, the two bowls clubs at Bongaree, the Surf Life Saving Club at Woorim on the 'surf side', and the small Solander Lakes Bowls Club at Banksia Beach. There is a well-established golf club at Woorim, with a second golf course and club house recently completed at Banksia Beach as part of the Pacific Harbour development. A small twin cinema was established in 1997 on McMahon Street. The existing bridge was the longest, pre-stressed, pre-cast concrete bridge in Australia at the time of its construction. With a length of 2736 feet (831.4 m), the bridge cost $716,321 and was officially opened on Saturday 19 October 1963 by the then premier of Queensland Frank Nicklin. An additional bridge onto Bribie Island has been proposed, and an official 'Bribie Island Bridge Corridor Study' was conducted in 2015 by the Queensland Department of Transport and Main Roads that supports this proposal. The study recommends the new bridge be built 15 metres (49 feet) north of the existing bridge, however the anticipated date of commencement has not yet been announced. A desalination plant has been proposed for Bribie Island by the National/Liberal Party (LNP). The previous (up to 2012) Labor government decided it was not a good place to build a Desal Plant. Some residents are opposed to the plant due to environmental reasons, however others see the plant as a benefit to the island. There are two primary schools: Bribie Island State School at Bongaree, and Banksia Beach State School, and one high school: Bribie Island State High School. Both primary schools are governed by a 'School Enrolment Management Plan', and only accept students who live within their designated catchment areas. Bribie Island State School was opened on 4 February 1924. Prior to the opening of the Bribie Island State High School in 1989 secondary students were transported to Caboolture. The 2006 enrolment at the high school was 954 students. Bribie Island State High School presently has over 1,000 students. Banksia Beach State School opened in 1992. Student numbers are continuing to rise annually and are now over 1,000 students. The Moreton Bay Regional Council operates a library service at 1 Welsby Parade, Bongaree. It also operates the Bribie Island Aquatic Leisure Centre on Goodwin Drive. Bribie Jetty at Bongaree is a popular recreation and fishing spot. According to the Australian Bureau of Statistics there were 16,209 persons resident on the island in 2006. Of these, 7796 (48%) were males and 8413 (52%) were females. Of the total population 1.6% were Indigenous persons compared with 2.3% for all of Australia. 13.6% of the population on the island were children aged between 0–14 years and 50.3% were persons aged 55 years and over. The median age of persons was 55 years, compared with 37 years for all of Australia. 75.7% stated they were born in Australia. Other places of birth included were: England 6.6%, New Zealand 4.0%, Germany 0.9%, Netherlands 0.8% and Scotland 0.8%. The median weekly household income was $609, compared with $1,027 for all of Australia. In 2004 a reality television series called The Hot House that aired on Network Ten was filmed on Bribie Island. The show entailed 14 couples building a house together knowing that only one couple would win the house and a number of prizes, including a boat, which came with it. On the final night of filming locals were given free tickets to enter the area which had been fenced off for filming. The Enigmatic Mr Phelps, a novel by Canada-based English international crime writer David B. Green, was partly set in Banksia Beach during the winter of 2004. It includes many references to the island and the surrounding area. Part two of the two-part novel, Berlin by Christmas, features an opening chapter based entirely on the island. The fictional character of "Phelps" is often confused with the real life of the author. Nick Earls' 1996 novel After January includes a description of a visit to the beach and the ruins of World War II battlements on the northern end of the island. ^ a b "Bribie Island (entry 4459)". Queensland Place Names. Queensland Government. Retrieved 20 November 2014. ^ Meston, Archibald (20 October 1923). Old Moreton Bay tribes; their languages. Brisbane Courier. p. 18. Archived from the original on 16 March 2018. ^ a b "Bribie Island – Queensland – Australia: Travel". The Sydney Morning Herald. 8 February 2004. Retrieved 30 October 2010. ^ a b "Bribie Island". queenslandholidays.com.au. Tourism Queensland. Retrieved 23 May 2011. ^ "Bribie Island's Wildlife". Retrieved 31 March 2013. ^ a b c Hema Maps (1997). Discover Australia's National Parks. Milsons Point, New South Wales: Random House Australia. p. 193. ISBN 1-875992-47-2. ^ "Bribie Island Swarm 14/09/2012". Archived from the original on 11 January 2016. Retrieved 31 March 2013. ^ "Bellara (Bribie Island) swarm shake". Retrieved 31 March 2013. ^ John St Pierre in Royal Historical Society of Queensland, John Kerr (editor), 2001, Flinders in Moreton Bay: A Bicentenary Review 1799-1999, Royal Historical Society of Queensland, Queensland. ^ Douglas, Bronwen (2014). Science, Voyages, and Encounters in Oceania, 1511–1850. Palgrave Macmillan. p. 118. ISBN 9781137305886. ^ "CONVICT'S NAME". The Courier-Mail. Brisbane: National Library of Australia. 15 January 1938. p. 14. Retrieved 20 November 2014. ^ a b c "Bribie Island Second World War Fortifications (entry 601143)". Queensland Heritage Register. Queensland Heritage Council. ^ a b c d e f g h Walding, Richard. "Fort Bribie". Archived from the original on 22 October 2016. Retrieved 23 May 2011. ^ Groves, John Frederick. & Groves, Janice. 2007, Digging deeper into North Bribie Island during World War II / John and Janice Groves John and Janice Groves, Caloundra, Qld. ^ "The bombing of Darwin – Fact sheet 195". National Archives of Australia. Archived from the original on 24 September 2011. Retrieved 23 May 2011. ^ "Fort Bribie". Queensland WWII Historic Places. Queensland Government. Archived from the original on 2 November 2018. Retrieved 2 November 2018. ^ "Japanese Conquests: 1939-1942". Naval History. 8 July 2011. Archived from the original on 2 November 2018. Retrieved 2 November 2018. ^ "United States forces in Queensland, 1941–45 – Fact sheet 234". National Archives of Australia. 9 August 2011. Archived from the original on 9 August 2011. Retrieved 2 November 2018. ^ Paul Hasluck, The Government and the People: Australia in the War of 1939–1945, vol. II (Canberra: Australian War Memorial, 1970) in Australian War Memorial Encyclopedia, "Archived Document". Archived from the original on 11 April 2013. Retrieved 19 January 2011. ^ "Brisbane line". OzAtWar. Archived from the original on 16 May 2002. Retrieved 23 May 2011. ^ "Queensland Public Libraries Statistical Bulletin 2016-17". Public Libraries Connect. November 2017. Retrieved 15 January 2018. ^ "Bribie Island Second World War Fortifications (entry 601143)". Queensland Heritage Register. Queensland Heritage Council. Retrieved 14 July 2013. ^ "Archived Document". Archived from the original on 8 March 2016. Retrieved 29 November 2015. ^ "Archived Document". Archived from the original on 30 May 2016. Retrieved 29 November 2015. ^ "Archived Document". Archived from the original on 8 December 2015. Retrieved 29 November 2015. ^ "Archived Document". Archived from the original on 4 April 2016. Retrieved 29 November 2015. ^ "Bribie Island State School: History". Department of Education and Training. Archived from the original on 7 April 2011. Retrieved 23 May 2011. ^ "Bribie Island Library". Public Libraries Connect. Archived from the original on 15 January 2018. Wikimedia Commons has media related to Bribie Island. This page was last edited on 18 April 2019, at 20:36 (UTC).